Russia was in a difficult financial position and feared losing Russian America without compensation in some future conflict, especially to the British, whom they had fought in the Crimean War (1853-1856). While Alaska attracted little interest at the time, the population of nearby British Columbia started to increase rapidly a few years after hostilities ended, with a large gold rush there prompting the creation of a crown colony on the mainland. The Russians therefore started to believe that in any future conflict with Britain, their hard-to-defend region might become a prime target, and would be easily captured. Therefore the Tsar decided to sell the territory. Perhaps in hopes of starting a bidding war, both the British and the Americans were approached, however the British expressed little interest in buying Alaska. The Russians in 1859 offered to sell the territory to the United States, hoping that its presence in the region would offset the plans of Russia’s greatest regional rival, Great Britain. However, no deal was brokered due to the American Civil War. Following the Union victory in the Civil War, the Tsar then instructed the Russian minister to the United States, Eduard de Stoeckl, to re-enter into negotiations with Seward in the beginning of March 1867. 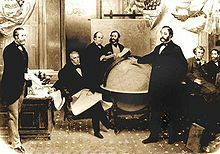 The negotiations concluded after an all-night session with the signing of the treaty at 4 a.m. on March 30, 1867, with the purchase price set at $7.2 million, or about 2 cents per acre ($4.74/km2). American public opinion was generally positive, as most editors argued that the U.S. would probably derive great economic benefits from the purchase; friendship of Russia was important; and it would facilitate the acquisition of British Columbia. “Already, so it was said, we were burdened with territory we had no population to fill. The Indians within the present boundaries of the republic strained our power to govern aboriginal peoples. Could it be that we would now, with open eyes, seek to add to our difficulties by increasing the number of such peoples under our national care? The purchase price was small; the annual charges for administration, civil and military, would be yet greater, and continuing. The territory included in the proposed cession was not contiguous to the national domain. It lay away at an inconvenient and a dangerous distance. The treaty had been secretly prepared, and signed and foisted upon the country at one o’clock in the morning. It was a dark deed done in the night…. The New York World said that it was a “sucked orange.” It contained nothing of value but furbearing animals, and these had been hunted until they were nearly extinct. Except for the Aleutian Islands and a narrow strip of land extending along the southern coast the country would be not worth taking as a gift…. Unless gold were found in the country much time would elapse before it would be blessed with Hoe printing presses, Methodist chapels and a metropolitan police. It was “a frozen wilderness. While criticized by some at the time, the financial value of the Alaska Purchase turned out to be many times greater than what the United States had paid for it. The land turned out to be rich in resources (including gold, copper, and oil). When it became clear that the Senate would not debate the treaty before its adjournment on March 30, Seward persuaded President Andrew Johnson to call the Senate back into special session the next day. Many Republicans scoffed at “Seward’s folly,” although their criticism appears to have been based less on the merits of the purchase than on their hostility to President Johnson and to Seward as Johnson’s political ally. Seward mounted a vigorous campaign, however, and with support from Charles Sumner, chairman of the Senate Foreign Relations Committee, won approval of the treaty on April 9 by a vote of 37-2. For more than a year, as congressional relations with President Johnson worsened, the House refused to appropriate the necessary funds. But in June 1868, after Johnson’s impeachment trial was over, Stoeckl and Seward revived the campaign for the Alaska purchase. The House finally approved the appropriation in July 1868, by a vote of 113-48. 598 – Balkan Campaign: The Avars lift the siege at the Byzantine stronghold of Tomis. Their leader Bayan I retreats north of the Danube River after the Avaro-Slavic hordes are decimated by the plague. 1282 – The people of Sicily rebel against the Angevin king Charles I, in what becomes known as the Sicilian Vespers. 1296 – Edward I sacks Berwick-upon-Tweed, during armed conflict between Scotland and England. 1814 – Joachim Murat issues the Rimini Declaration which would later inspire Italian Unification. 1822 – The Florida Territory is created in the United States. 1842 – Anesthesia is used for the first time, in an operation by Dr. Crawford Long. 1855 – Origins of the American Civil War: Bleeding Kansas – “Border Ruffians” from Missouri invade Kansas and force election of a pro-slavery legislature. 1863 – Danish prince Wilhelm Georg is chosen as King George of Greece. 1867 – Alaska is purchased from Russia for $7.2 million, about 2 cent/acre, by United States Secretary of State William H. Seward. The media call this Seward’s Folly. 1885 – The Battle for Kushka triggers the Pandjeh Incident which nearly gives rise to war between the British Empire and Russian Empire. 1909 – The Queensboro Bridge opens, linking Manhattan and Queens. 1910 – The Mississippi Legislature founds The University of Southern Mississippi. 1918 – Outburst of bloody March Events in Baku and other locations of Baku Governorate. 1939 – The Heinkel He 100 fighter sets a world airspeed record of 463 mph. 1940 – Sino-Japanese War: Japan declares Nanking capital of a new Chinese puppet government, nominally controlled by Wang Ching-wei. 1944 – World War II: Allied bombers conduct their most severe bombing run on Sofia, Bulgaria. 1945 – World War II: Soviet Union forces invade Austria and take Vienna; Polish and Soviet forces liberate Gdansk. 1949 – A riot breaks out in Austurvollur square in Reykjavik, when Iceland joins NATO. 1954 – The Yonge Street subway line opens in Toronto. It is the first subway in Canada. 1961 – The Single Convention on Narcotic Drugs is signed in New York City. 1965 – Vietnam War: A car bomb explodes in front of the US Embassy, Saigon, killing 22 and wounding 183 others. 1972 – Vietnam War: The Easter Offensive begins after North Vietnamese forces cross into the Demilitarized Zone (DMZ) of South Vietnam. 1976 – The first Land Day protests are held in Israel/Palestine. 1979 – Airey Neave, a British Member of Parliament, is killed by a car bomb as he exits the Palace of Westminster. The Irish National Liberation Army claims responsibility. 1981 – President Ronald Reagan is shot in the chest outside a Washington, D.C., hotel by John Hinckley, Jr.
1982 – Space Shuttle program: STS-3 Mission is completed with the landing of Columbia at White Sands Missile Range, New Mexico. 2006 – The United Kingdom Terrorism Act 2006 becomes a law. 2009 – Twelve gunmen attack the Manawan Police Academy in Lahore, Pakistan.